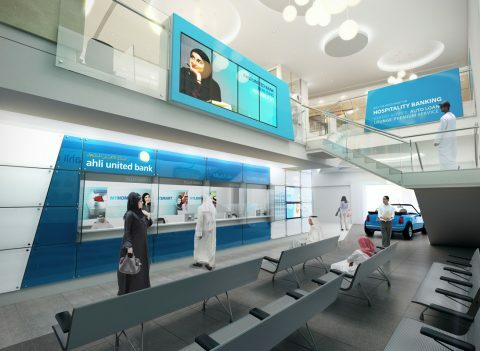 A retail concept for Ahli United Bank being rolled out at bank branches in Egypt, Oman and beyond. The new branch format offers two core service streams: ‘Interactive Banking’, using technology to deliver efficient transaction services, and ‘Hospitality Banking’, providing a comfortable and discreet environment for customer advice & sales. The retail experience offers a new brand presentation, with a distinctive angular design treatment rendered in vibrant colour-backed glass and refined stone. The branch exterior offers a new, dynamic visual treatment incorporating a portal, large format graphics and high-impact signage. Digital communication and interactive kiosks provide a richer customer experience within the branch, and the Premium Zone provides a new level of customer service for high net worth customers in all branches.